Help Topics — open the in-built help files containing this present "Userguide". All settings and functions of the Client Terminal are described in it.F1 button performs the same action. Online Search — go to searching on MQL5.community. Video Guides — links to educational videos about Signals, Hosting and Market on YouTube. 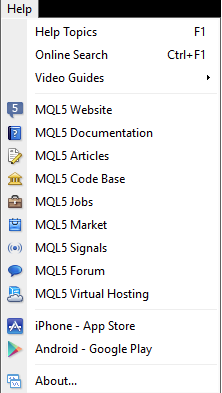 Links to MQL5.community sections — using the menu you can quickly go to the main sections of mql5.com: "Documentation", "Articles", "Code Base", "Jobs", "Forum", "Market" and "Signals". iPhone - AppStore — a link to download the mobile terminal for the iOS powered devices. Android - Google Play — a link to download the mobile terminal for the Android powered devices. About... — open the "About..." window where one can find information about the company, its contact details, and the terminal version, as well.